My Plus Quilt has been finished since March. 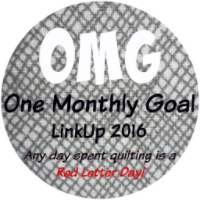 I finally decided to get it quilted and set it as my June OMG goal. And it is the last of my Q2 Finish Along goals. I decided to keep it simple and did FMQ loops in the background. 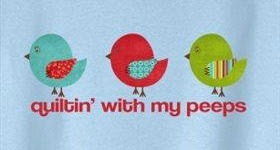 I wanted the pluses to pop, so I left them unquilted. Striped binding for the win. Just waiting for a new baby, and then it can go to its forever home. The fun continued on Day 2 of Glamp Stitchalot. The first class of the day was with Rashida Coleman-Hale. A paper pieced airplane (tail and wing sections), which included regular piecing and curved piecing (nose section). The row consists of three airplanes, 20.5 x 12.5 inches each. We learned to use a glue stick to secure the first piece of fabric. Genius! Starting has always been difficult for me. 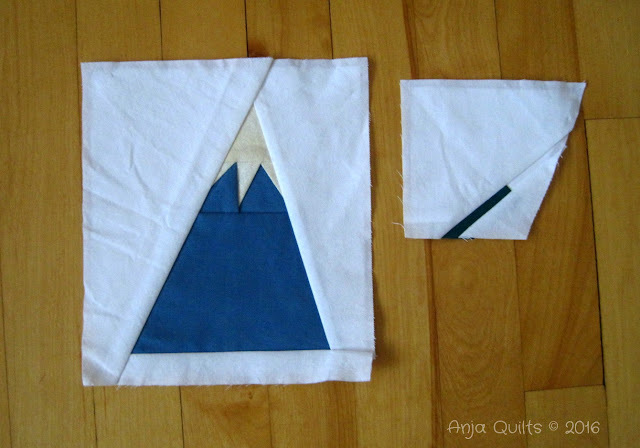 Rashida also cuts her fabric pieces according to the template (remember to include seam allowance). We didn't use this technique in class, but she showed me how to do it. I think it would be helpful. Using the glue stick and the technique I learned from Penny Layman the day before, I was able to finish this block in class. My hatred of paper piecing started to wane during this class. And as much as I wanted a break from paper piecing, it was good that our next class was more paper piecing with Carolyn Friedlander. Building on what I had learned already and being in the groove, I actually enjoyed making this block. Carolyn's row consisted of three of these blocks, each 20.5 x 12.5 inches each. Carolyn shared two great tips. She uses the largest stitch on her machine to baste down the first piece of fabric (and any long piece). Game changer!!! She also suggested basting down the outside pieces so that it's easier to join all the sections together. Carolyn also showed us how to measure the size of the pattern to determine how wide a piece of fabric to cut, and she suggested cutting strips of fabric to that size. Using all the great tips that were shared, I was able to complete one of Carolyn's blocks. And I love it. And I stopped hating paper piecing. I can't say that I love paper piecing or that it's my new passion, but at least now I have techniques to make it easier, and I'm not opposed to trying it again. And then to finish the day, our next class was with Elizabeth Hartman @ Oh Fransson. 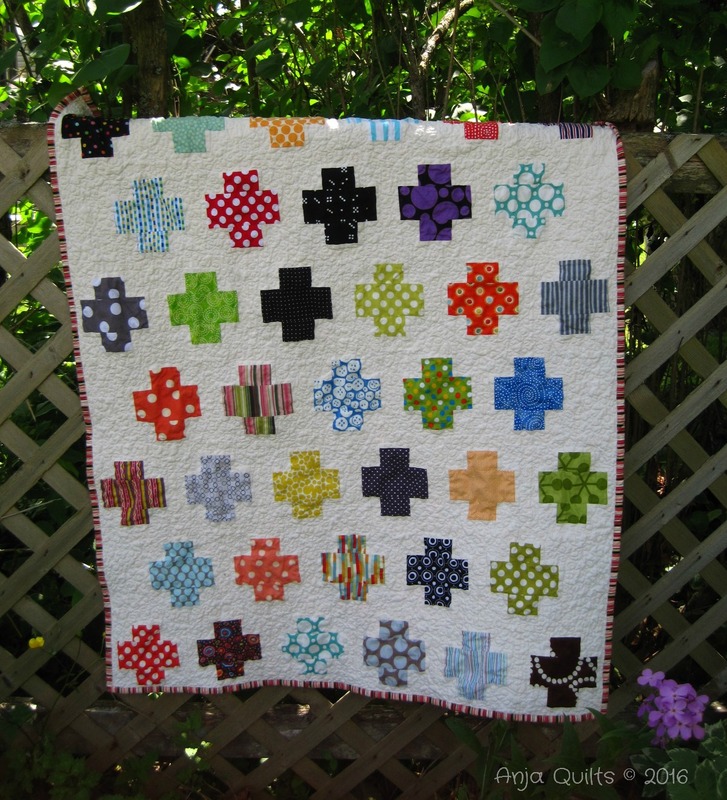 Time for some regular piecing. The Studios row is 8 x 60 inches, and the One Bedrooms row is 4 x 60 inches. I finished both rows at Glamp. Although I didn't do it (because I had already pre-cut all my pieces), Elizabeth showed us how to fussy cut prints. Instead of cutting a template to the unfinished size, she recommends cutting a piece of freezer piece to the finished size of the piece. That way, you can ensure that you don't cut off bits of the print you want. 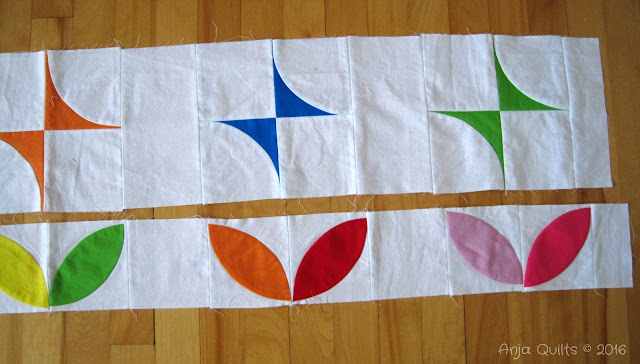 Iron the freezer paper onto the fabric and add a seam allowance before cutting. Such a simple thing, but genius!! And then sadly, it was all over. Nothing to do but pack up and get a good night's sleep. I had an awesome time, learned some awesome quilting techniques, and met some wonderful new friends. Thanks to Jenn @ A Quarter Inch from the Edge, Julia @ Jada's Quilting Adventure, and Dena @ No Frickin' Blog Yet, for going on this adventure. When is our next retreat?? 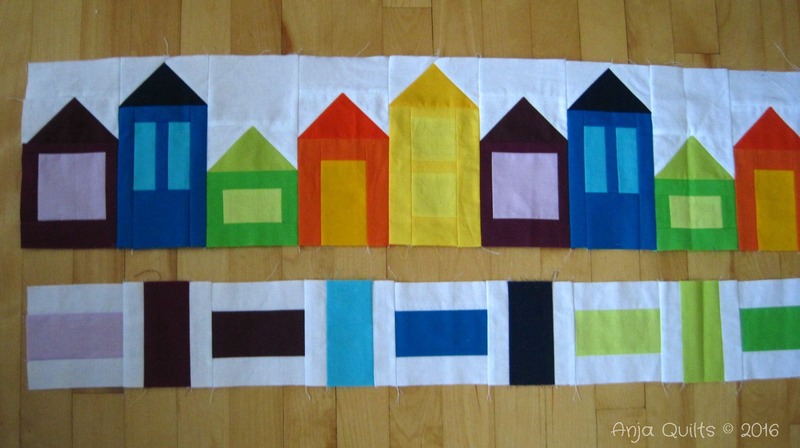 Off to find some time to finish the rest of the paper pieced blocks so I can piece all the rows together. In our swag bag at Glamp Stitchalot, we received a coloured bracelet which determined which group we were in for classes. 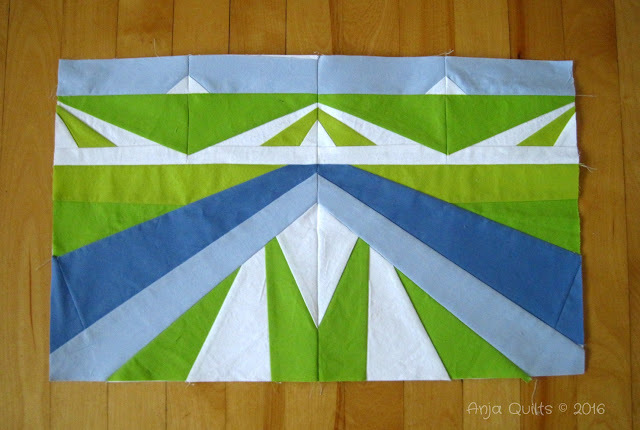 The green group was awesome, and luckily, there was only one paper piecing class on day one. Our first class was with Monica Solorio-Snow -- Happy Zombie. The theme for her two rows was: Binge-Watch - "When all you want to do is binge-watch Netflix while making a quit about binge-watching." The Fast Forward row is 8 x 60 inches, and the Slow-Mo row is 4 x 60 inches. 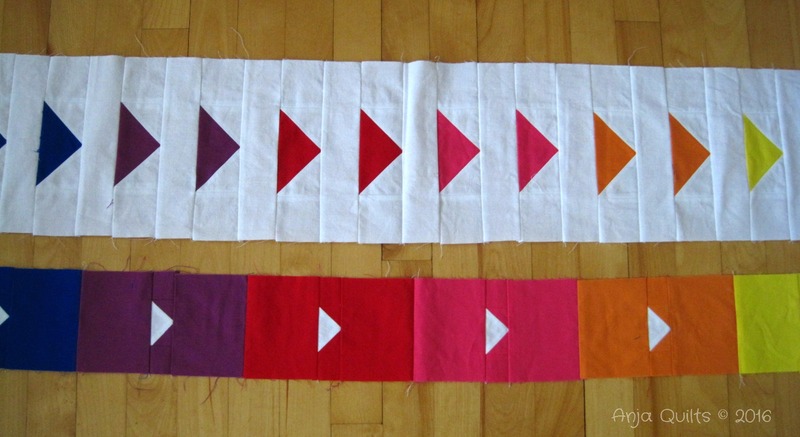 We learned to use the EZ Quilting Flying Geese ruler. Amazing tool!! No wasted fabric, and the pieces sew together wonderfully. I finished both rows at Glamp. Our next class was paper piecing with Penny Layman -- Sew Take a Hike. 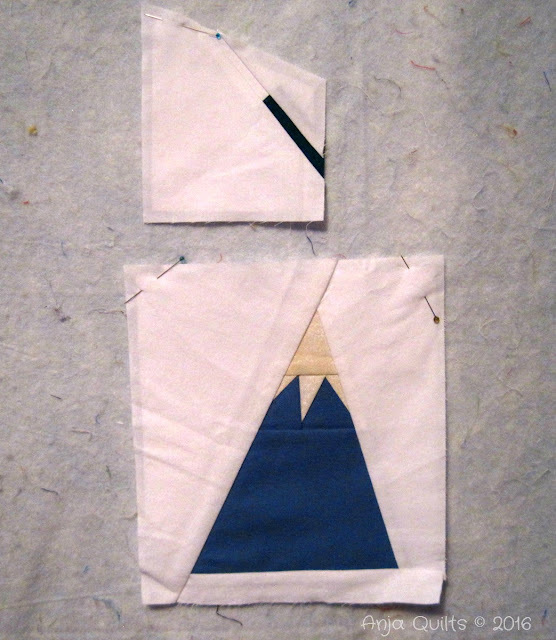 The mountain block is 7 x 8 inches finished; the tree block is 7.5 x 8 finished; and the star block is 4 x 4 inches finished. I always have trouble figuring out where to place the fabric, so Penny showed me to fold the paper and fabric along the line next to be sewn. This gives a line on the back to help with fabric placement. This was a game changer and definitely helped me finish the mountain block. I started on the tree block, but I didn't finish any more blocks while at Glamp. The final class of the day was curved piecing with Violet Craft. 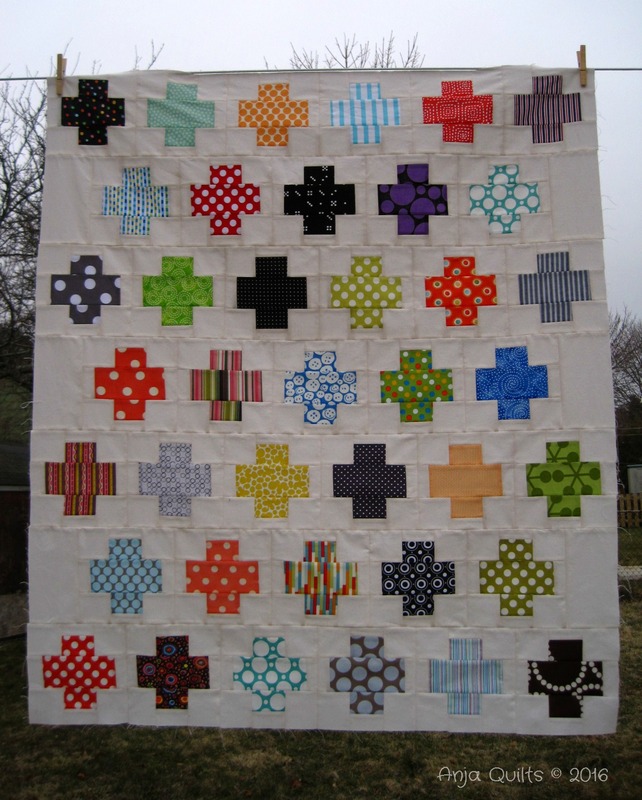 The Mod Pin Wheels row is 8 x 60 inches, and the Pieced Orange Peel Petals row is 4 x 60 inches. Violet showed that the trick to curved piecing is very few pins -- just one pin at the beginning, one in the middle, and another at the end. She said the fabric knows where it wants to go, so let it. And it was true. It made sewing all the curves very easy, and I managed to get both rows sewn at Glamp. I was a total fan girl and had my photo taken with the teachers. Stay tuned for details on our day two classes. This was an awesome event, and I'm looking forward to attending other quilting retreats in the future. 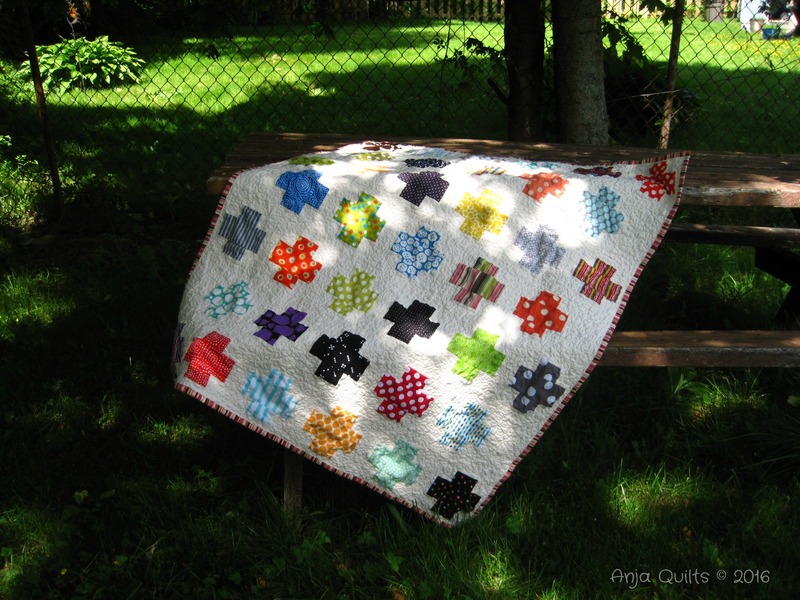 Earlier this month, I went on a quilting adventure with Jenn @ A Quarter Inch from the Edge, Julia @ Jada's Quilting Adventure, and Dena @ No Frickin' Blog Yet. At the end of February, we discovered Glamp Stitchalot, being held in Ann Arbor, Michigan, and the in span of less than 24 hours, we purchased event tickets, purchased flights, and booked hotel rooms. It took a few days to come to terms with what we had done. 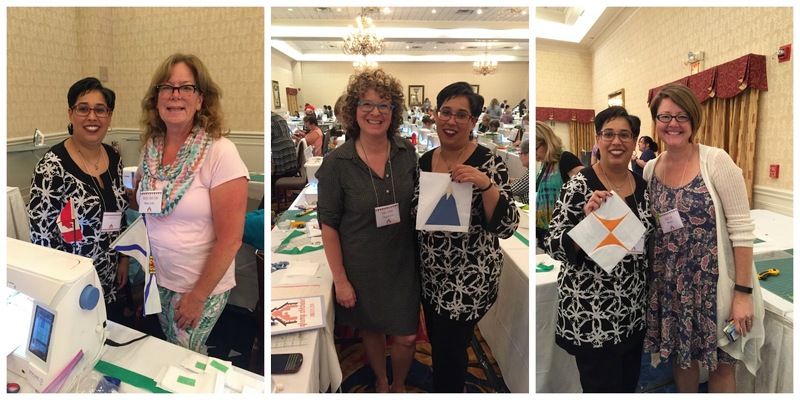 With the low Canadian dollar, it proved to be an expensive weekend, but we were excited about the teachers for the weekend: Monica Solorio-Snow, Penny Layman, Rashida Coleman-Hale, Elizabeth Hartman, Violet Craft, and Carolyn Friedlander. Who could resist??? We headed out on a Thursday, leaving home at 3:00 a.m. for a 5:30 a.m. flight. Unfortunately, we were delayed in Toronto for 2.5 hours. Thanks for cutting into our shopping time Air Canada. So instead of going straight to the hotel, we had the driver take us to Pink Castle Fabrics, the host for Glamp Stitchalot. 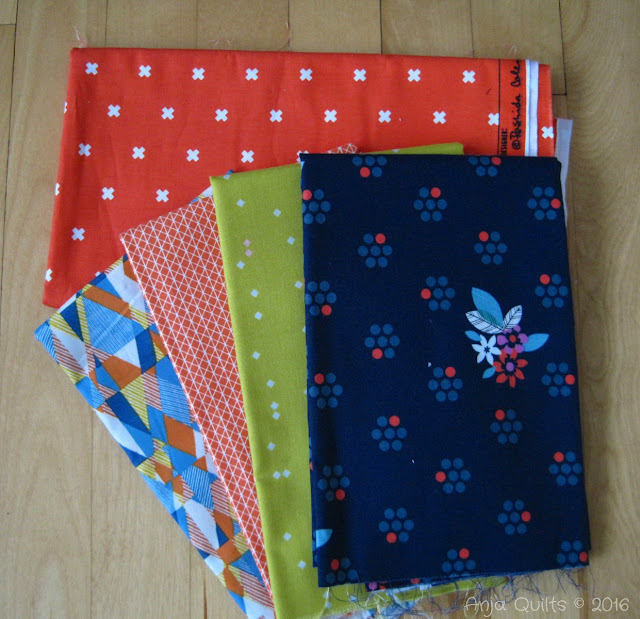 First fabric purchase...modest half-yard cuts, with one yard of the wonderful orange. We received a wonderful swag bag...an orange bag!! 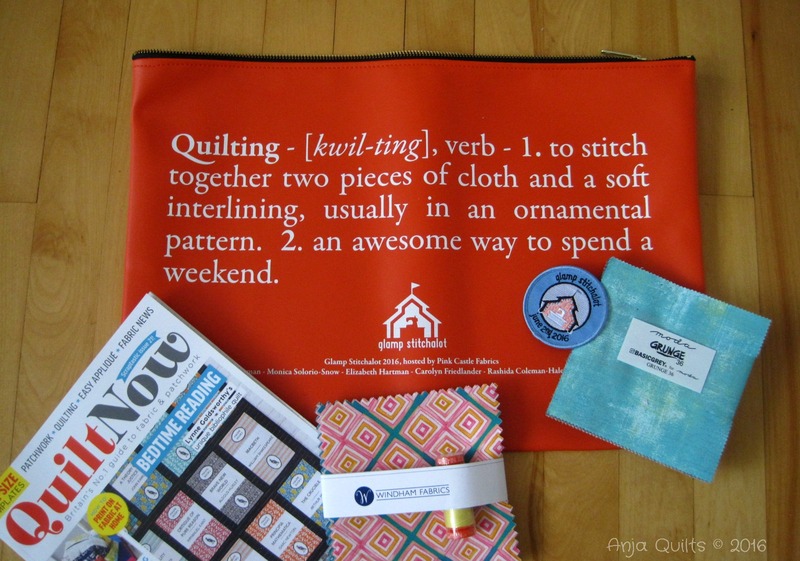 Goodies included two charm packs, a spool of Aurifil thread, a magazine, and an event crest. There was an optional pouch swap. 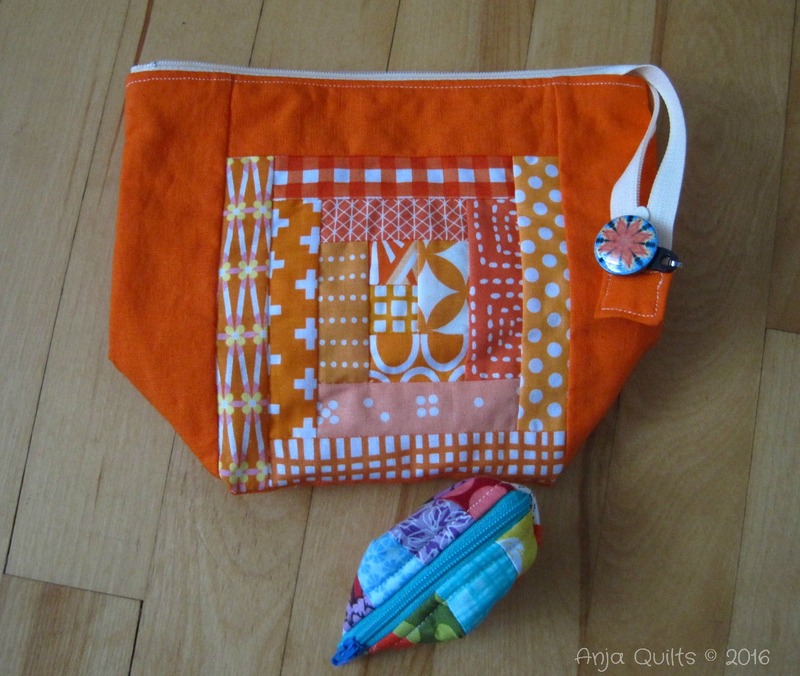 I received this awesome orange pouch from Elaine @ Messy Goat. She also included a tiny pouch. This was a great orange weekend for me. There was a pop-up shop on site, so a visit was in order. 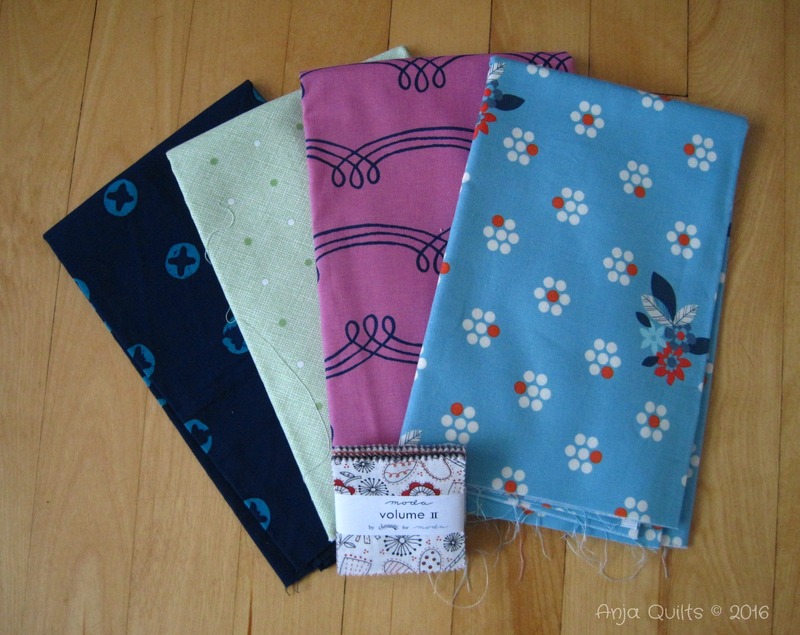 Some more half-yard cuts and a mini charm pack. Stay tuned for details about the blocks I made during the classes. Head over to see what Jenn and Julia had to say about the weekend. 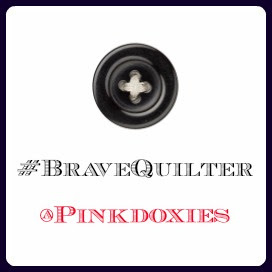 Cutting it close to the deadline for June's #BraveQuilter link up. I hate paper piecing; however, I may have moved from hate to don't like. 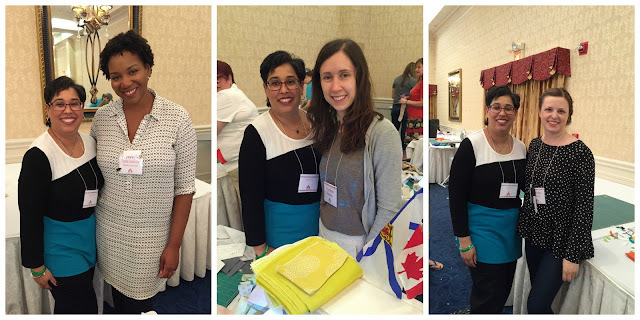 Last weekend, I attended Glamp Stitchalot (more details in a future post). Three of the six classes were paper piecing. Are you kidding me???? However, each of the teachers provided a helpful hint, and with those techniques, I was able to finish some of the blocks. 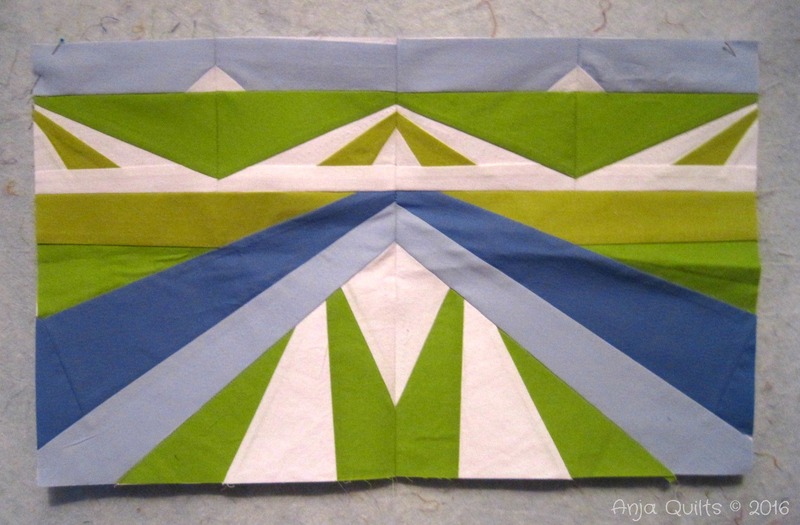 Here is my block from Carolyn Friedlander's class. I need to make two more blocks to finish the row in the quilt. This is my favourite block of all the paper piecing. There were three blocks in Penny Layman's class. I finished my mountain. I got one section of my tree done, but didn't get to the star block. I think there are five mountains, five trees, and seven stars to finish the row. 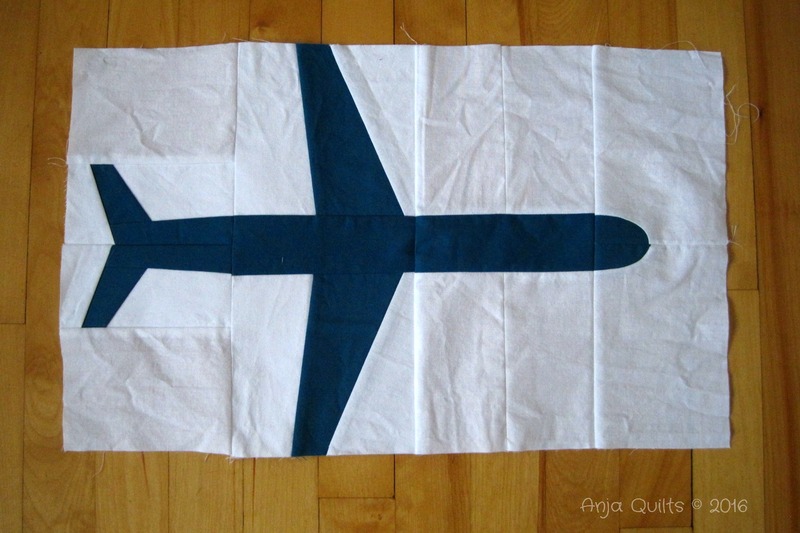 The airplane in Rashida Coleman-Hale's class was partially paper pieced. I need to make two more airplanes to finish the row. Because of the new techniques I learned, I'm going to attempt to finish the rest of the paper pieced blocks. I'm not committing to making them all, but I would like to do two more Carolyn Friedlander blocks at a minimum. I finished the rows from the other three classes. Stay tuned for a post about the adventure. It's time to set a June goal for OMG. 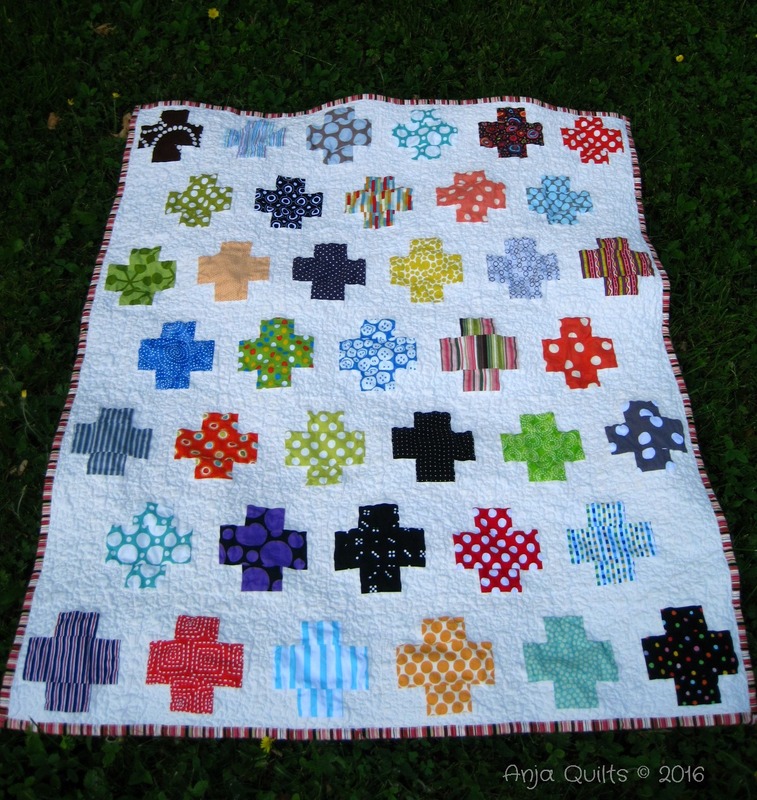 I need to quilt my Plus Quilt, which I pieced back in March. It is the last of my three Finish Along 2016 Q2 goals. 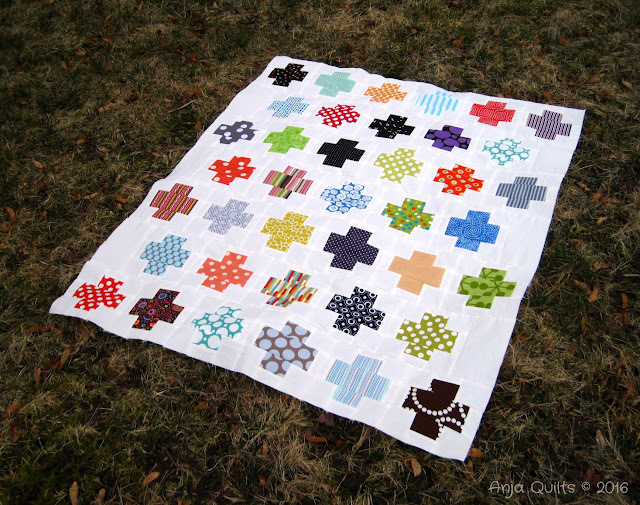 Still undecided on the quilting, but I'm going to have to make up my mind shortly as time is running out. June is a busy month, so nothing fancy, likely loops in the background.